We combine many proprietary innovations into the Vigilant Power Monitor to offer the most advanced RF power diagnostic for plasma processing applications. The result? Help you to improve the performances of your plasma processing equipments! Here are some frequent questions & answers about our products. Q1. Why is it necessary to measure the RF power between the matching network and the plasma discharge? Because up to 90% of the RF generator power can be lost in the matching network. The power delivered by your RF generator is therefore a bad approximation of the true dissipated power in your discharge. How do you make reliable and consistent comparisons between your experimental results and the scientific literature if your "data vs power" curves are wrong? How can you develop a good numerical model of your discharge by validating it with inaccurate experimental data? Here is a review of the literature about the power coupling efficiency in RF discharges and some measurements performed with the Vigilant Power Monitor. Q2. The output of my matching network isn't equipped with a coaxial connector. How can I connect your probe inside? It isn't necessary to use standard coaxial connectors with our probes. They can be equipped with simple straight adapters to connect its ports to copper straps or rods. Q3. What are the electrical sensors used in your probes? Why are they customized? We developed a wide range of RF voltage and current sensors to fit many experimental conditions because the small plasma reactor for academic research excited at 13.56MHz with 50W doesn't use the same sensors than a large semiconductor processing reactor excited at 40.68MHz with 5kW. We use high performance patented electrical sensors: wideband, robust, low-pertubative and compact RF voltage and current sensors developed through extensive experimental work and 3D electromagnetic modeling. The range and sensitivity of these sensors are customized during calibration to maximise performance for your application. These sensors are also used in the Vigilant Sensor. The 3D electromagnetic and thermal modeling of our products is performed with CST Microwave Studio by CST AG. CST Microwave Studio is a leading edge tool for the fast and accurate 3D simulation of radiofrequency devices and market leader in Time Domain simulation. We can therefore quickly develop customized probes optimized for your application. Q4. 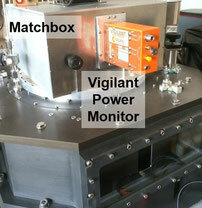 What is the electronics used in the Vigilant Power Monitor? The Vigilant Power Monitor is equipped with an innovative ultra high speed (>3GS/s) and high resolution (12bits) cutting edge patented acquisition electronics with USB connectivity to sample directly and simultaneously the RF voltage and current waveforms at a high repetition rate. The acquisitions can be synchronized with an external gating signal from an RF power generator in pulsed RF applications. Q5. How do you calibrate your probes? We use an automated highly accurate calibration process to ensure the best measurement accuracy and probe to probe repeatability. Our calibration process is NIST-traceable and uses the best electronic test intruments available today in a temperature and EMI controlled environment. Q6. How did you develop the software interface? The Vigilant RF Lab is developed using the industry-proven ANSI C development environment LabWindowsTM/CVI 2015 by National InstrumentsTM. For over 25 years, developers have relied on LabWindows/CVI to create stable, high-performance applications for manufacturing, military, aerospace, telecommunications, automotive and semiconductor industries.